Thirty years after Dr. Roger Callahan published his first book using what was at that time called Callahan Techniques®, now known as Thought Field Therapy (TFT), the proof of its effectiveness in changing lives is abundant. The research, case studies and instructions supporting the effective use of TFT and other energy psychology techniques is easily available. Tens of thousands of professionals and peers around the world have received training in its use. Dr. Callahan’s books have been translated into 12 different languages. TFT is not language, age, or culture specific and can be used universally. In service oriented communities of all kinds, exposure to TFT and tapping or energy psychology in general is becoming more and more common. In November the TFT Foundation supported their trainers and practitioners in Rwanda as they reached out to surrounding African nations and peoples needing trauma relief. From the IZERE Center in Byumba, there were 20 TFT trained therapists who participated in the Youth Forum to support African Youth from five nearby countries. Many were treated and others trained to be able to share TFT with those in need. On the 12’th of December, there will be a community treatment day where several hundred Rwandans will be provided treatment. We often can only treat 200 but the line has included up to 535 people in the past. Next year we hope to expand our capacity for the community treatment days. From the newly formed NGO and TFT Foundation Kigali, Celestin Mitabu trained and treated many new people in Burundi. We thank you all who have contributed to support these missions and the many others throughout 2014. If you wish to learn the procedures they are learning in Africa, go to our trauma relief site as we have the protocol in 14 languages in video and print. The web site for this has changed to a new and easier URL, www.TFTTraumaRelief.com . Please share it with friends and family during this holiday season. Help us to serve as many as possible with this gift of healing. Most people come to TFT and try tapping because they want to be happier or improve their quality of life. They know that if they could reduce their stress, fears, anxiety, pain and many other negative emotions or conditions they could be happier, they could find their ideal mate, get a better job, or attract greater success into their lives. We strive to help people and expand on the use of TFT, and have created classes that will guide you to the solution to a specific solution. Best of all, you can start the class immediately on purchase – and all are priced to be affordable. Below you’ll find our most popular classes, as well as our latest newsletters. 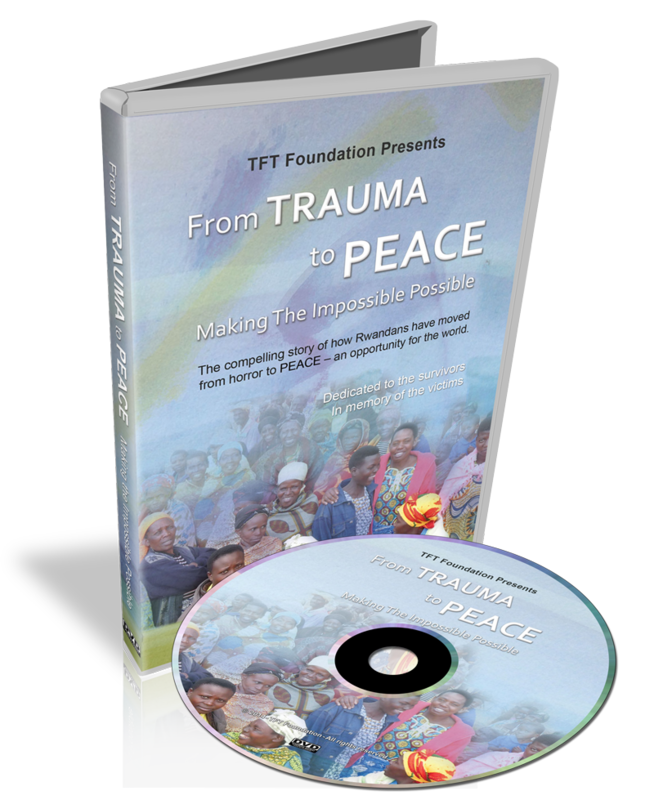 The TFT Foundation’s documentary From Trauma to Peace is complete! Watch and hear story after story told of the horrors suffered by Rwandans and the transformative healing that has taken place in their lives since learning TFT. The Rwandans have forgiven. And, through the healing power of TFT, they have not only forgiven, they have transformed themselves from survivors to happy, productive and loving people. One of our TFT Foundation board members, Mary Cowley, wrote a wonderful description for the documentary. What is TFT Voice Technology? What Is TFT Voice Technology and what will I be able to do with it? How long will it take me to put it to work after I take the course? I get asked these questions and others all of the time. So,I thought I would share something from two of our recent Optimal Health grads and one of our long time TFT-VT practitioners, Dr. Colin Barron. Maria attended our recent course in Brazil and even sent us a YouTube video of her excitement. For those of us that don’t speak Portuguese, she kindly sent me the English translation. Yolanda attended our Paris Optimal Health course and shares her first ever case, her infant daughter’s amazing recovery from being ill.
Then Dr. Colin Barron, a long-time TFT-VT practitioner and physician in Scotland, shares a complex OCD case. It is an example of how quickly and thoroughly one can use VT to address a complicated and previously recalcitrant problem, and how it holds up over time. Tapping can help bring peace to our world. Each year the International Day of Peace is observed around the world on 21 September. The UN General Assembly has declared this as a day devoted to strengthening the ideals of peace, both within and among all nations and peoples. The first Peace Day was observed in September 1982. It is an annual day of non-violence and cease-fire. The United Nations invites all nations and people to honour a cessation of hostilities during the Day, and to otherwise commemorate the Day through education and public awareness on issues related to peace. Please join us at Callahan Techniques, and the TFT Foundations in sharing our documentary, From Trauma to Peace. It is due to be released at the end of the month. Help us to create greater awareness that there are powerful tools available to all of us to begin healing the trauma and violence in the world. View the trailer here and share with all of your mailing lists. WWW.Trauma2Peace.com . You can learn simple self-help procedures from the TFT Foundation’s free trauma relief site: www.TFTTraumaRelief.wordpress.com . As the 13th anniversary of September 11 approaches, we are reminded of the great need for trauma relief and healing in our world. We remember all those who lost loved ones on that tragic morning. We remember them, as well as the countless others who have suffered in wars and disasters. Please join us in remembering September 11 and offering healing tools to all who know the pain of loss and grief. There are numerous ways to participate in the healing of trauma through Thought Field Therapy (TFT). The TFT Foundation’s documentary, From Trauma to Peace, about healing from the genocide in Rwanda is a powerful example of the transformation of a people. Please share this link to the trailer and help us create an awareness that there is a way to transcend trauma and begin healing: www.TFTFoundation.org. Scroll down and view the brief trailer. Perhaps with the healing of trauma we can begin to break the cycles of violence around the world. If you know someone who has suffered from 9/11, or any other disaster, reach out and share the healing tools of TFT with them. The TFT Foundation’s trauma relief website has the trauma relief protocol in video and print in 14 languages. This material is free to all who need it. The web site is: www.TFTTraumaRelief.wordpress.com. However you choose to commemorate the 9/11 anniversary, thank you for joining us as we take a day to remember and begin healing others. Now we have one simple place that you can go to find the “tools” that many of our TFT practitioners use for themselves as well as their clients. We are often asked, Where can I get Rescue Cream?, or, What is a therapeutic dose of zeolite?, or, What is the model # of the voltmeter you use?, I am constantly negative, what can I do about it? These questions and more are mentioned in our special issue of the Thought Field, Tools of the Trade, also found on the web page. You can feel confident that all of the things we recommend on this page are used and have been tested by us both on ourselves and our clients. We test them with Heart Rate Variability (HRV) as well. Over the years we have searched for the best values for our systems like the HRV scanners we use and the new brainwave EEG system. This represents a valuable resource for TFT practitioners and customers alike. While none of the so called “tools of the trade” for TFT are needed in order to effectively make improvements, there are several tools that we have used over the last three decades that can greatly enhance our skills, increase our success rate, maintain improvement and improve overall well-being. These TFT tools are applicable to all levels of TFT users. They are a combination of both time-tested tools that Roger discovered over 30 years ago to some that are just being introduced and even some that we are currently testing. Some of the articles and cases in the newsletter available on the Tools page will discuss the importance and offer ways of use. Click here to get a copy of the newsletter and visit our new “Tools of the Trade” web page. The film is undergoing color correcting, subtitles and credits now and will be submitted to film festivals the first of September. DVD’s will be available in the next month or so. Note: There is still room for a couple of sponsors credits so if you would like your name on the film credits contact joanne@TFTfoundation.org . Earlier this month, Suzanne Connolly, Joanne Callahan and Prosper Ishimwe, their Rwandan translator and TFT trainer, had the privilege of spending a week in Hawaii. They were working on the final shooting, editing, and translations of the documentary, From Trauma to Peace, Making the Impossible Possible. Using Thought Field Therapy to Instantly Conquer Your Fears, Anxieties, and Emotional Distress. By Roger J. Callahan, PhD, with Richard Trubo, Forward by Dr. Earl Mindell.